Just a few of our large collection…looking forward to re-using my maps of Paris and London this year! Call me old-fashioned, but how I love a paper map! Laminated or not, a map offers so many specific details about where I’m headed, from elevation to campsites to the width of the road to the locations of airports, hospitals — even windmills! I love the anticipation of reading a map and wondering how the landscape will resemble its contours. On long road trips, I like having a sense of progression — yup, we passed that exit! 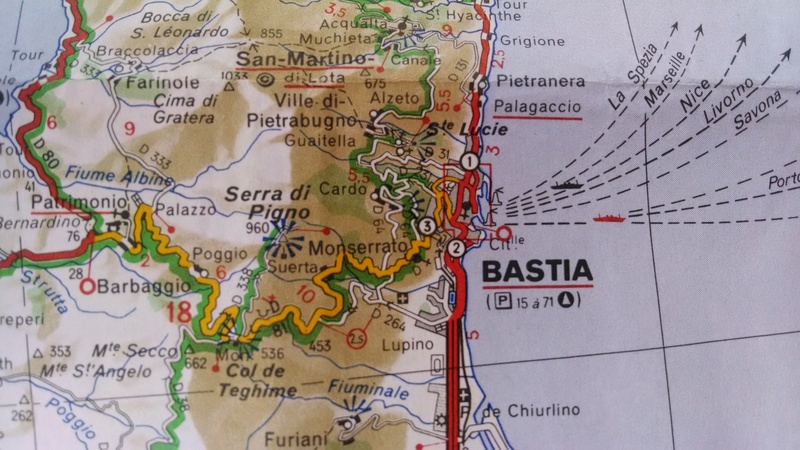 I treasure my battered paper map of Corsica, scene of one of the happiest weeks of my life, anywhere, ever. I had been fired from one magazine job and found a new one a week later, with a healthy raise. Score! I had one week to enjoy, and knew exactly where I wanted to go, this island off of the southern coast of France, known for its rugged, hilly terrain. I decided to travel by mo-ped, with a top speed of 45 mph, making a circle tour through the Balagne, the northern bit. I used a Frommer’s or Fodor’s guidebook and booked my hotels in advance so all I had to do was get from one to the next. Imagine driving through the maquis, that scrubby brush filled with sun-warmed herbs, your nostrils filled with its aroma, the sun on your back, winding down hairpin turns to the sea. I love the details that maps offer — like all the ferry routes marked here. My solo week in Corsica, July 1995, was one of the best of my life! While out there alone, I drove past the Deserts Des Agriates, one of the most eerie and desolate landscapes I’ve ever seen. I had no camera, but will never forget it. I also love the physicality of maps, how they link us to every explorer before us, from Magellan to Lawrence of Arabia. I can’t count the number of times I’ve used Mapquest for directions that somehow didn’t work; without a map, I’d have been toast as we don’t have or use GPS. — Turn right, assassin to your immediate left! — Are you still alive? Consider this, though: Using printed maps requires travelers to work together. You become a team. Driver and navigator. Your ability to get along and solve problems is tested in valuable, revealing ways. GPS removes that entire interpersonal dynamic. It encourages a passive form of journeying: sit back and drift, because the vaguely Australian-sounding computer lady will tell you to turn left in a quarter mile. Driving by map, on the other hand, engages you actively with your surroundings. It makes you observe road signs, be in the moment. And that closer engagement, I’ve found, imprints the landscape more vividly and permanently on your mind. When I return home, I can unfold my maps and take myself back to a town or a stretch of highway. Do you still ever use paper maps? Maps make such a great souvenir. You can’t tape your GPS on the wall with pushpins to mark where you’ve been. Ooooh, true! 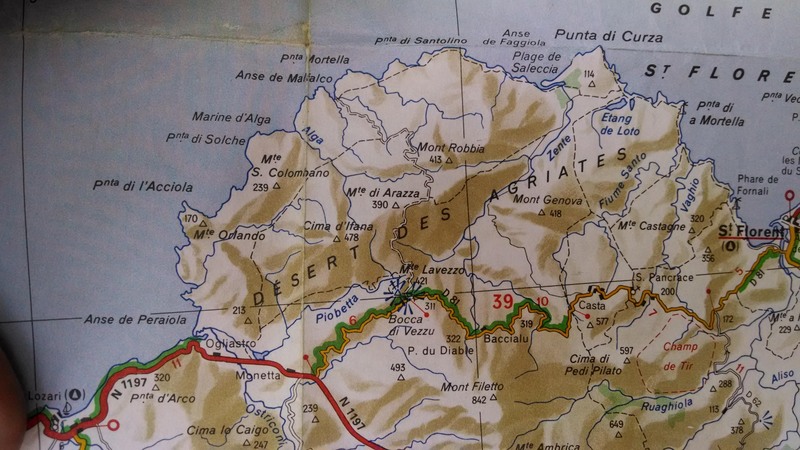 Or cut them into pieces for your journal…Just looking at my Corsica map brings it back. I am dying to go back there. I love maps! When my kids were small we did a fair bit of roadtripping in our province, and I had a road map of Manitoba on which I marked everywhere they had been with pink highlighter. Me, too. The best gift EVER was from my first husband (and he was broke at the time) — the Times World Atlas. I treasure it. Digital just doesn’t cut it. However, thanks to digital I can cruise some of the old maps that I don’t have immediate access to. Thanks for weighing in — and I know that some people have a lot of difficulty with direction. For whatever reason, I’m pretty good with it (can usually [w sun] even tell you what time of day it is without a clock.) I tend to not trust technology becs if it fails you — and you have no analog backup….? When I worked for the Daily News and got sent to some hellish NYC neighborhoods, I was very glad of my 5-borough map! Getting lost is not amusing…esp. with the current cost of gas! I do like paper maps a lot though because you get a better idea of what surrounds you, as opposed to a GPS, which is like “turn here, turn there, go straight” in a very regimented fashion. (And that’s assuming the GPS is even correct.) Very robotic with limited opportunity for the kind of exploration you can have with a map. Scary!! Glad you are OK…. You make a great point. This is why I dislike GPS. With a map I have a much larger context for where I am (hello, highway exits?) I also know it cannot fail me in any technical sense. I think knowing how to navigate is a fairly essential life skill. I completely agree, which is why I have made an effort to cultivate it instead of relying on GPS. I do use GPS quite a bit but I also know how to read a map. To me, it’s like knowing basic arithmetic or knowing how to find information in a library. A lot of people might consider that knowledge obsolete but I personally like to have some parts of my brain that aren’t entirely dependent on a computer to function! Wow. That’s so true. I imagine there is a whole generation (likely several by now) who just use tech as their default choice. I get it but I prefer it as an add-on. I love maps, and don’t have a GPS. I find maps beautiful and suggestive of adventure! What is it with maps?! I find them so alluring, too. I still have maps from when I traveled Europe, in 1984. They’re my treasure, my time capsule. I imagine roads have changed since then and that’s also the beauty of maps. They chart history. I rely on GPS when I’m on the road, because I usually travel alone, but I still buy maps. Especially city maps. I purchased a lovely map of New York when I was there in 2007. It mapped the location of museums and art galleries. Loved it. Unfortunately I don’t have it anymore, but when I go back to New York I’ll be looking for a replacement. I love how one can, literally, retrace your past by reading them. So glad this one resonated for you! I have the fondest memories of my father reading maps on vacation in the car. I remember the sound of them, the crinkle. And I remember feeling like we were always in good hands. I’ll take my father’s strong hands and that crinkle over the dumb blonde in my nav system anytime:). At least, she sounds like a dumb blonde. Oh, the memories! I love all the stories people are sharing here. I just don’t imagine many romantic memories of GPS. I love paper maps. There’s something so deliciously tangible about them, and every fold, every corner. every crease normally has a story to tell. Also you can mark them with stuff – the raggedy map of Mexico City I have in my mother’s cupboard in Singapore has a million stories (mostly of the many silly things I did) to tell just trying to get me around the city. Then again, I do disclaim this with the fact that I have never owned a phone in which Google Maps works, so I cannot speak of being able to get somewhere when I need to. I have observed that when I am out walking aimlessly, my wayfinding is faultless. Give me a precise destination and a timeframe in which to find it, and you can guarantee that I’ll get lost, map or no map, even with specific instruction. But yes, maps. Delicious, visual representations of a world that never seems so impossible when you can trace a route with your eyes, imagination, a finger, or thumbtacks and string. Thanks! I bet you’ve been using a lot of them this year. Map craft and orienteering are becoming a lost art. The really cool part of this is how bloody beautiful some maps are! Aren’t they though? I love vintage and antique maps as well. A child of the iPhone generation, it’s always refreshing for me to travel (as I have been doing these last few weeks) without cell service and have to navigate with a paper map. Although I find it sometimes an embarrassing badge of tourism, I learn cities much better and as you said bond with my fellow travelers when I have to pay attention to where I am rather than blindly following directions. Heyyyyyyy! I have wondered where you were…have so missed hearing from you. How have you been? I’m doing well! Finally getting to travel again so I’ve gotten back to regular blogging. And true, although the effort it takes to know where I am can sometimes be a bit of a challenge! Although well worth it. This is so fascinating, as usual. I can see that having GPS on our phones can be very handy, though I can’t actually work mine (I think I may have pressed the wrong button and deleted the functionality). Recently I’ve started sticking maps to the wall of my writing room: the map I had when I backpacked around Ireland in the 1990s (at some point I had to sticky-tape the creases because it was getting fragile), another when I caught the train from Vancouver to Toronto and then a friend and I toured around Quebec and the Maritime States, and two others maps – one of south-east Western Australia where I lived for a couple of years, one of Launceston in Tasmania where I bunked down to write for a month. 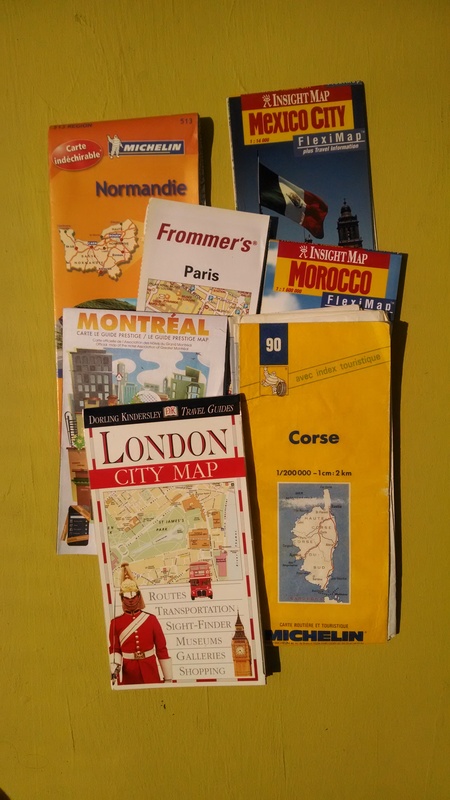 I’m not sure why exactly I’ve started putting maps on my walls, but I do like staring at them as I write – I think it’s something about hoping that the lines on the maps will help me find my way into and through and out of whatever it is that I’m writing. Needless to say, the maps will be staying on the wall for some time. I love that you know my country a bit — and the train from YVR to YYZ (airport codes, y’know) — is very cool indeed. So often, it’s tourists who see so much more of our country than we do. You might enjoy today’s NYT travel story about an area of Newfoundland, which we keep meaning to get to….but so many competing spots beckon as well. I’m glad you saw PQ and the Maritimes, both of which are well worth it. I also like the very basic idea that maps, literally, orient us. Man (and woman) has been using them for millenia.